Gowron has lost some height, and all the mass had to be applied somewhere else. And after looking through my bags (lots of gear, and old-stuuf), I joined LFG...1sec..found group, DTK. After I zoned in, I noticed something was wrong, no PallyPower, so I opened my spellbook for the blessings :p. After blessing everyone, I wanted to pull, but apparantly a rogue or DK was getting bored and started already... sorry to say, but if you want to make your tank angry, you should do just that /leave. 15 minutes later, join LFG, enter dungeon, VH this time. I am rusty, but when the healer was complaining about boredom, I knew it went good :p. After the dungeon, I noticed I had now 2 Frost and 5 Triumphs. I wonder where those other 2 triumphs came from, I don't recall doing any trumph-related stuff on Gowron. At the end of the 4 runs, my fingers where again going smoothly over my belkin, hitting the right buttons, although I should us Sacred Shield more on bosses I guess. No one died in the runs, and my second mana-bar (the healer's one), was never below 75%. 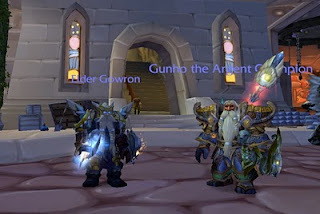 I sometimes did have problems with aggro, mmm, actually some dps had problems with aggro, going all out on a Mob I wasn't targetting, but most of the time that didn't even matter, probably because of Seal of Command.. I never stopped reading Maintankadin, so I knew that for 4 or more mobs, Seal of Command gives better aggro. Because Hammer of the Righteousness works on max three targets, every time I had a pull of 4 or more, I switched from Vengeance to Command, and had almost no problems with the aggro. Actually Command also gives more threat on 3 mobs then Vengeance apparantly, but that would mean a lot more Seal-changing, and I did struggle with mana. Probably because I didn't felt comfortable enough to massive chain-pulls yet. Today I will probably que for some of the normals, especially TotC for that stam-trinket. And for the ICC-dungeons also, gief upgrades. And I will be doing some of the AT-dailies, I noticed that I am almost exalted with all factions, so time to get another title. I also noticed that I am 1, maybe 2 runs away from being exalted with the ashtongue deathsworn, the Black temple-faction, so maybe i should get that up.